Whether you are considering door replacements, undertaking a remodeling project or simply looking for a way to improve your home, doors can have a considerable impact. Different types of doors can change traffic patterns, bring more light into a room, create a connection between indoor and outdoor areas, or give an area a more open feel. 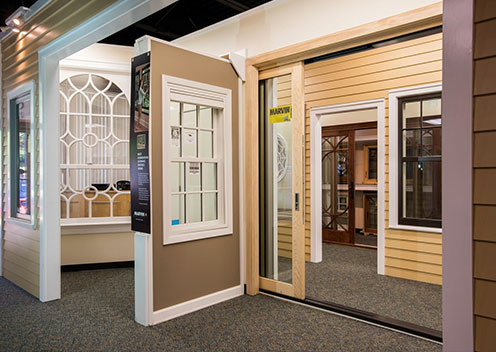 The doors you choose will determine what kinds of change you can make, and a company like Marvin Windows and Doors can offer you many types of doors to consider, all with Marvin’s renowned durability, customizability and top notch style. Swinging French – elegant style and energy efficiency compete for the best reason to choose these doors. With Marvin’s endless design combinations, you can create a door that’s all your own. Sliding Patio – Not the cheesy old aluminum slider from the Brady Bunch days, these state-of-the art doors are precisely engineered to operate effortlessly, let in the light without unwanted heat, seal out the cold for coziness, and endure reliably for decades. Multipoint locking for security. Sliding French – No room for swinging doors? The Sliding French door is dressed in the same elegant styling as it’s swinging counterpart, however the Sliding French incorporates the same effortless gliding and highly rugged track of Marvin Sliding Patio doors. Enjoy the best of the old world and the new! Archtop French – Marvin made it’s reputation on round top windows, and the graceful curves of the Archtop French Door make any entrance into a welcoming masterpiece. BiFold Doors – An engineering tour de force, the bi-fold door acts like a folding wall that neatly disappears, one panel at a time, so you can connect indoors with outdoors in the blink of an eye. Lift and Slide Doors – Life on the inside meets life on the outside with these unique doors that also provide remarkable energy efficiency in their masterful design.